A Haniwa terracotta horse 1966 definitive on cover. Made of coiled clay, it and objects like this, were interred with the deceased from the 3rd-6th cent BCE during the Kofun Period. This horse is from the 6th cent and resides at the National Museum in Tokyo. Thank you for this postcard Kiyoshi! 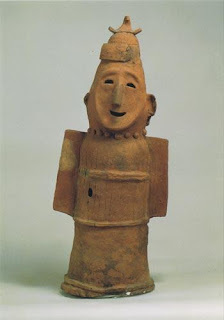 This Haniwa is known as 'Man Holding a Shield', and comes from a large burial tumulus.